Width: 10mm (approx. 3/8"). Thickness: 1.25mm. Design: hand engraved Plumeria all around with scallope (cutout) edges. Stamp: 925. Approx 17.6 grams. Width: 10mm (approx. 3/8"). Thickness: 1.25mm. Design: hand engraved Plumeria all around with scallope (cutout) edges. Stamp: 925. Approx 19 grams. Width: 10mm (approx. 3/8"). Thickness: 1.25mm. Design: hand engraved Plumeria all around with scallope (cutout) edges. Stamp: 925. Approx 20.5 grams. Width: 10mm (approx. 3/8"). Thickness: 1.25mm. Design: hand engraved Plumeria all around with scallope (cutout) edges. Stamp: 925. Approx 21.7 grams. Width: 10mm (approx. 3/8"). Thickness: 1.25mm. Design: hand engraved Plumeria all around with scallope (cutout) edges. Stamp: 925. Appox 16.2 grams. Width: 10mm (approx. 3/8"). Thickness: 1.25mm. 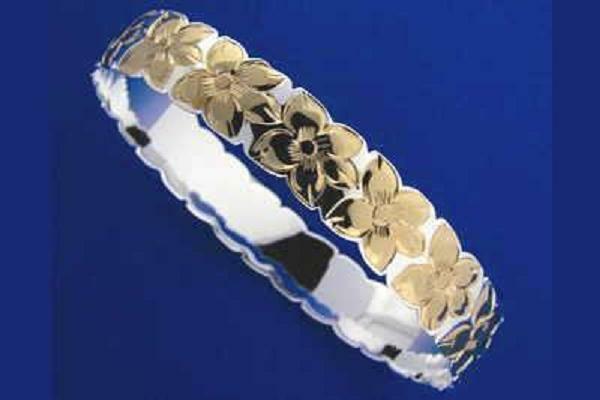 Design: hand engraved Plumeria all around with scallope (cutout) edges. Stamp: 925. Appox 17.6 grams. Width: 10mm (approx. 3/8"). Thickness: 1.25mm. 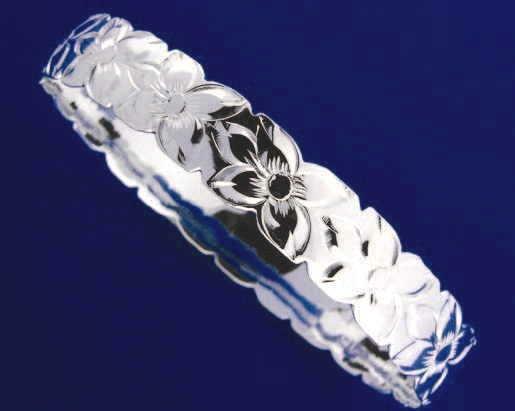 Design: hand engraved Plumeria all around with scallope (cutout) edges. Stamp: 925. Appox 19 grams. Width: 10mm (approx. 3/8"). Thickness: 1.25mm. Design: hand engraved Plumeria all around with scallope (cutout) edges. Stamp: 925. Appox 20.5 grams. Width: 10mm (approx. 3/8"). Thickness: 1.25mm. Design: hand engraved Plumeria all around with scallope (cutout) edges. Stamp: 925. Appox 21.7 grams. Width: 10mm (approx. 3/8"). Thickness: 1.25mm. 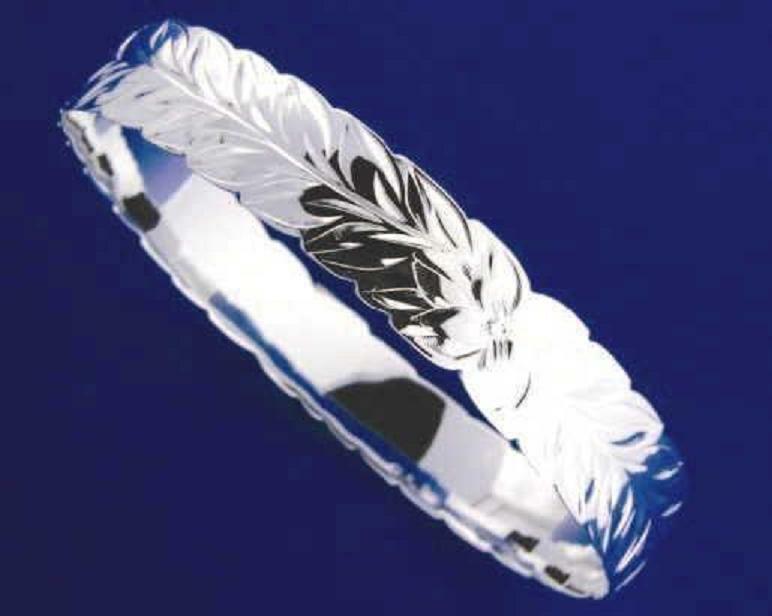 Design: hand engraved Plumeria and Maile leaves with scallope (cutout) edges. Stamp: 925. Approx 16.2 grams. Width: 10mm (approx. 3/8"). Thickness: 1.25mm. Design: hand engraved Plumeria and Maile leaves with scallope (cutout) edges. Stamp: 925. Approx 17.6 grams. Width: 10mm (approx. 3/8"). Thickness: 1.25mm. Design: hand engraved Plumeria and Maile leaves with scallope (cutout) edges. Stamp: 925. Approx 19 grams. Width: 10mm (approx. 3/8"). Thickness: 1.25mm. Design: hand engraved Plumeria and Maile leaves with scallope (cutout) edges. Stamp: 925. Approx 20.5 grams. Width: 10mm (approx. 3/8"). Thickness: 1.25mm. Design: hand engraved Plumeria and Maile leaves with scallope (cutout) edges. Stamp: 925. Approx 21.7 grams. Flower size: 10mm (approx. 3/8"). Petal: polish edge around brush finish. Length: 7" + 1/2" extension. Weight: approx. 8.3 grams. Stamp: 925. Stone: Cubic Zirconia (CZ).